Conductive hearing loss is a hearing deficiency which is caused by the non conductance of sound signals to the ear drum and ossicles of the middle air. 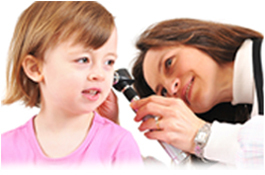 In this type of hearing problem faint sounds are lost in the conduction process. This impediments usually occurs where the outer or middle ear are defective and not able to transform the sound signals to the inner area without losing its intensity. Existence of fluids in the middle ear due to cold, ear infection, malfunction of eustachian tube, perforations in ear drum, ear wax etc are the causes for the conductive hearing loss. Presence of foreign particles, congenital deformities, swimmers ear, absence or malformation of outer ear, middle ear or the inner ear etc are also the causes for conductive hearing loss. Conductive hearing loss caused by infections of the ottis media can be treated by antibiotics or eardrops. ‘Tube in the ears’ is a procedure used to drain the fluid behind the eardrum. Ruptured eardrum can be treated by medications. A surgical procedure is also used for treating ruptured eardrums and temporary dysfunctions of organs related to hearing process.